“This trip was the perfect way to re-invest in my interest in photography and explore a fascinating country and culture [of Oaxaca, Mexico] at the same time. I can’t imagine an instructor or guide who could have better managed the balance and flexibility to so successfully meet all the goals of the program,” says Kathy Heath, who is a University of Wisconsin-Milwaukee assistant dean. 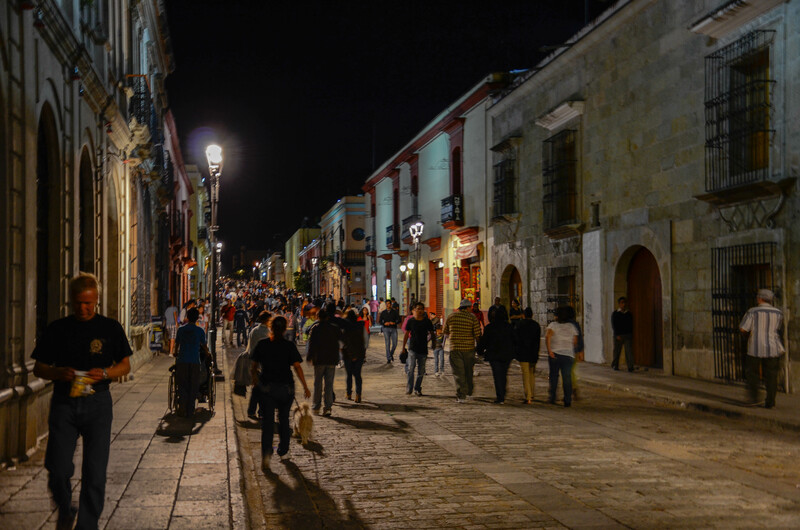 Almost like an early motion picture scene, almost like an old hand-colored sepia photograph, this stunning shot of the Macedonio Alcala at night says, yes, Oaxaca is safe, warm and welcoming. 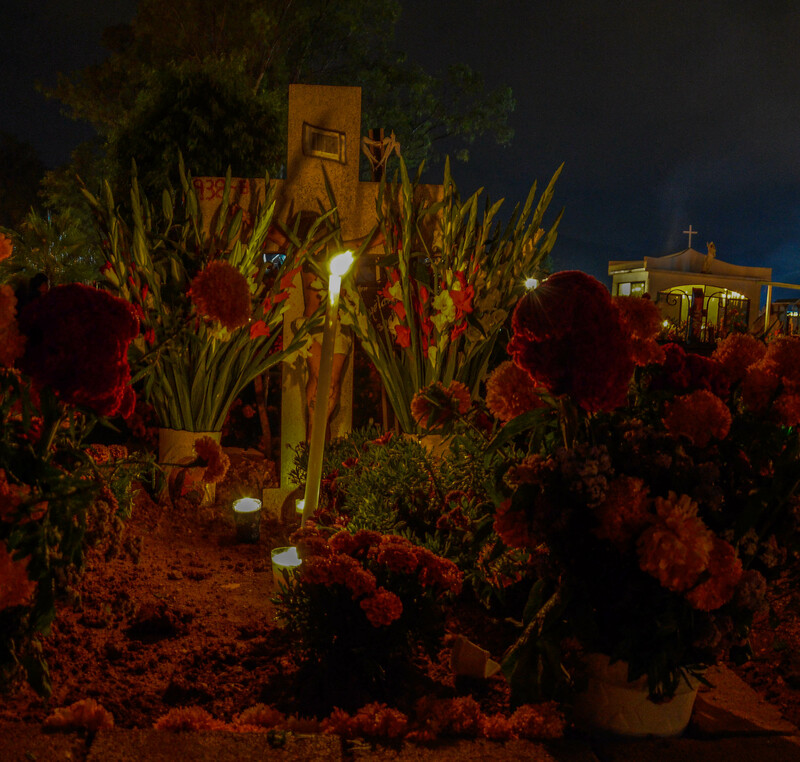 “I never had any concerns about my safety in Oaxaca. People were friendly, helpful and open,” says Kathy who goes by her nickname Louie. Louie, has traveled around the world with her camera (and her husband) and showed us some stunning shots from a recent hiking trip she took in New Zealand. The photos she took in Oaxaca are a tribute to her photographic experience and sense of aesthetic to capture the moment. These two photos (above) give us a close look at the comparsa and the seriousness of acting the part! 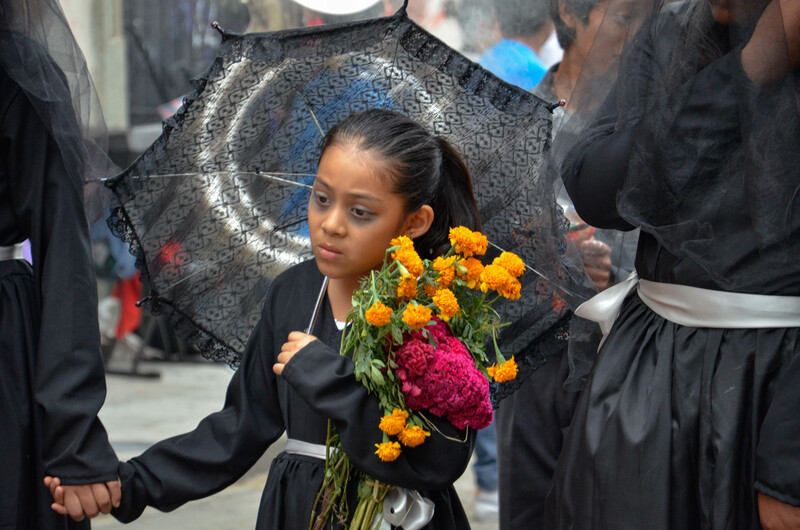 (Photo 4, Left) The comparsas are also a time for young people to plan their costumes and participate in the parade. 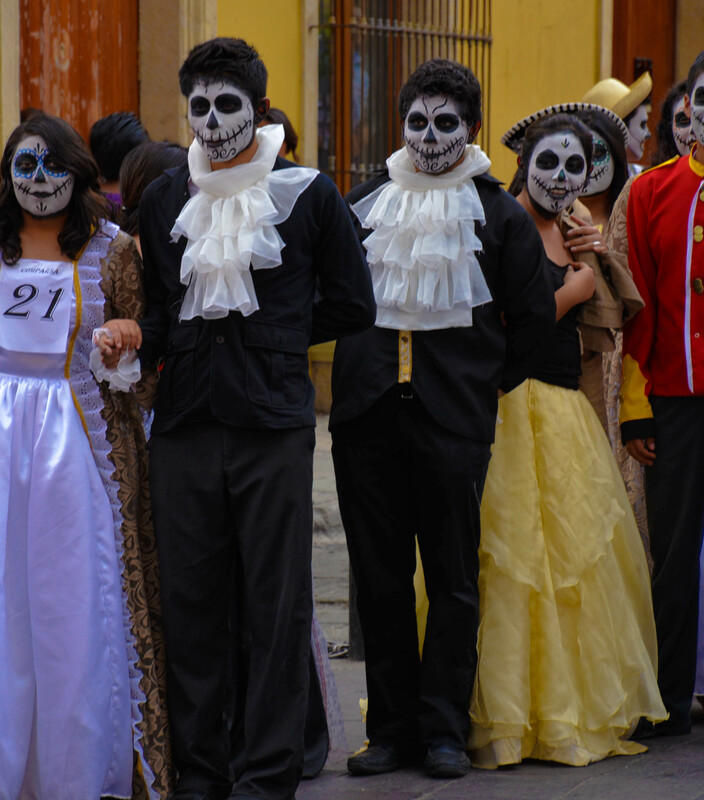 This group is competing for best costumes, along with many others who walk Macedonio Alcala and then assemble on the Zocalo to see who won. We love the combination of seriousness and frivolity in this photo. 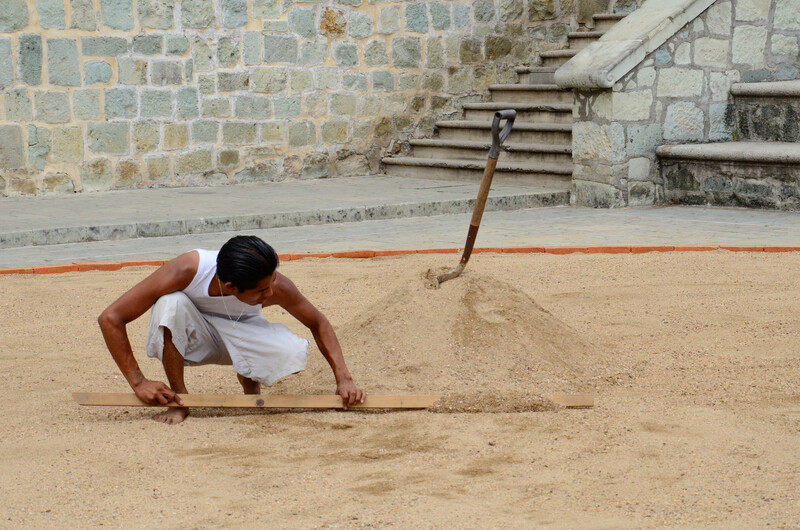 We got to Plaza de la Danza, adjoining the Basilica de la Soledad, early in the week as the preparations for building the sand sculptures was just starting. This Photo 5 is like a dance or a prayer, perfect image for the location! 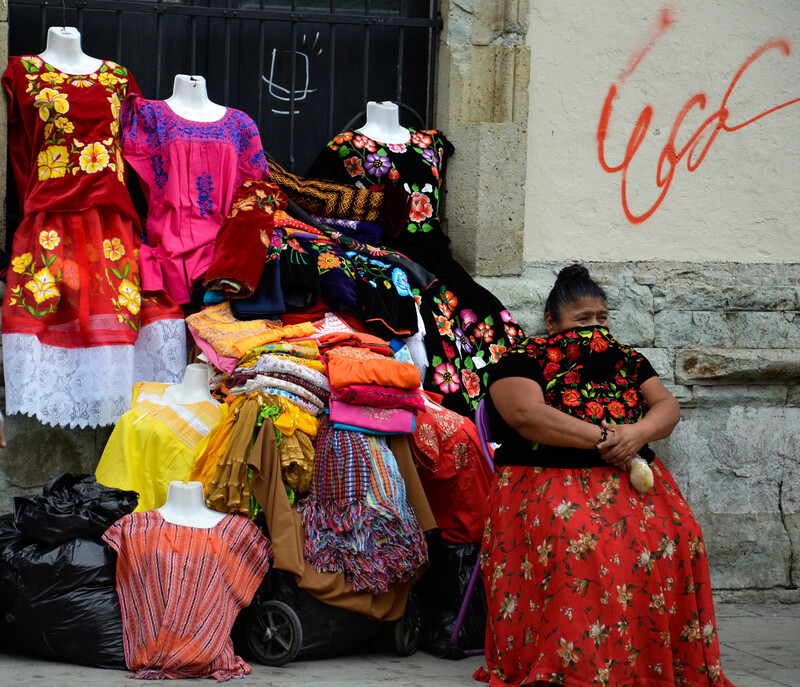 This street vendor could be from the Isthmus of Tehuantepec based on her style of dress. The scene blends many undecipherable messages, from wall graffiti to her blouse pulled up over her nose and mouth. Your guess is as good as mine! Photo 6 by Louie! 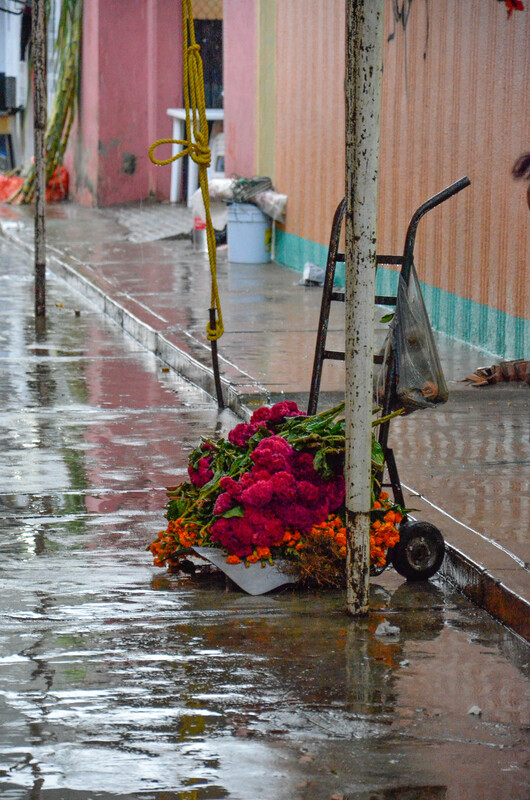 In Photo 7 (left) Louie captures the gloss of the slick, wet street and a hand-truck filled with flowers destined to decorate a gravesite at Xoxocotlan’s old cemetery. The rain came down and everyone ran for cover! 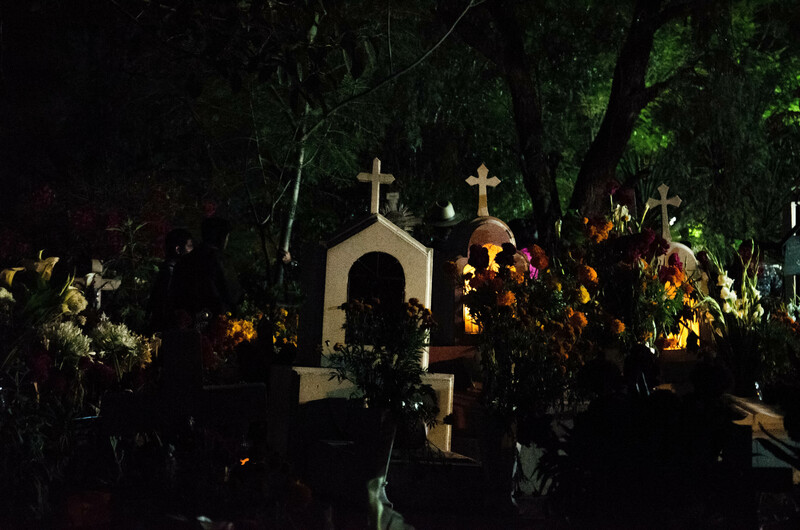 Photo 8 tells us about the dark, deep richness of a cemetery with little or no ambient light. The beauty is in the serenity of Photo 9. “It’s hard to decide what I learned or discovered that was MOST valuable. From technical aspects of photography and my camera, to different artistic perspectives about photography, to the culture and history of the area – it was all really valuable to me in very different ways,” says Louie. 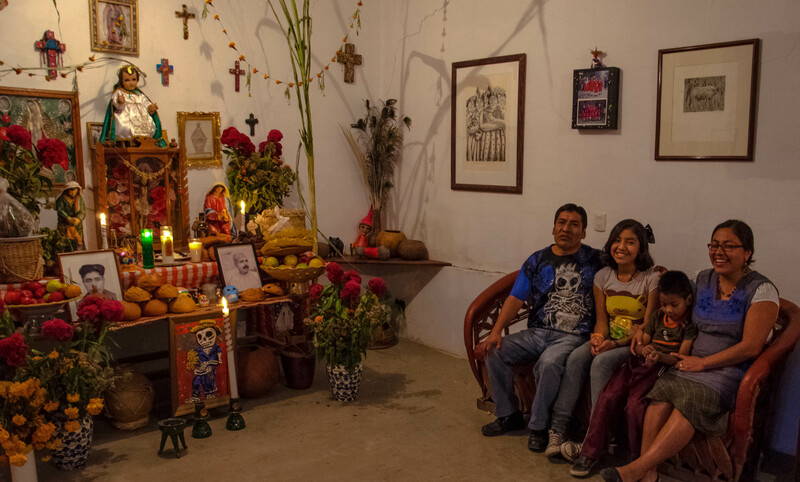 Louie, along with her friend and colleague, Connie Jo, spent Day of the Dead in Teotitlan del Valle with Alejandrina Rios and Tito Mendoza and their family. Louie managed a photo that included the ornately decorated altar and the warmth of the family. “Thanks for a great trip and learning experience Bill & Norma! !,” Louie says. We say, thanks to you, Louie, for your compassionate sensitivity and insight to show us Oaxaca through your eyes. 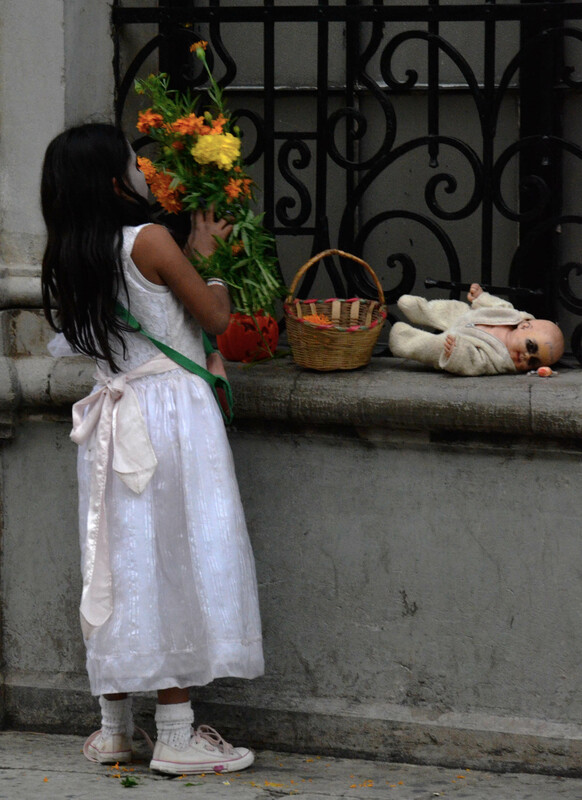 This entry was posted in Cultural Commentary, Oaxaca Mexico art and culture, Photography, Teotitlan del Valle, Textiles, Tapestries & Weaving and tagged blogsherpa, day of the dead, Mexico, Oaxaca, photography. Bookmark the permalink.